Who doesn't love brownies? I sure do love them but I have to admit that I do not make from scratch. Not because I can't, but I rarely ever buy cocoa. No, I am referring to the hot chocolate packets but that good cocoa you cook and bake with. Therefore, I always use brownie mix. However, I am never satisfied with just ordinary brownies. I experiment so much with the brownie mix that I may as well make them from scratch. Although, I think skipping the brownie base (the mix) allows me to be a bit more creative. 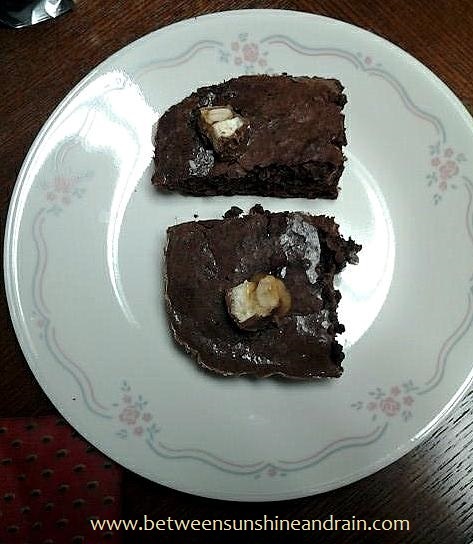 One of those moments of creativity resulted in my Brownie Surprise. Brownie Surprise is a rich indulgent brownie flavored with espresso and Snickers pieces. Heat oven to 350°F. Grease bottom only of 13x9-inch pan. In large bowl, combine brownie mix, espresso powder, coconut oil, water, and eggs. Beat with a spoon until smooth. Spread batter in greased pan. Sprinkle evenly with Snicker pieces. Bake at 350°F for 28 to 30 minutes. Allow to cool before cutting into bars. These brownies have that rich flavor and kick of espresso with the crunchy, gooey goodness of Snickers baked into them. Of course, you can use any brownie mix, brand of instant espresso, and even chocolate candy that you wish. Recipes to me are a great foundation for a dish. However, you always need to cook to please your taste and the taste of those you are cooking for. So adapt it to suit your taste. I always do.